So I'm starting to experiment more with GPS.... I've got a Garmin Oregon 450T which comes pre-loaded with the 1:100,000 USGS topos for the US. I've used it primarily for saving waypoints of favorite locations and navigating to waypoints. I've also used it for the altimeter functions, general compass navigation and for a little geocaching. I'm now interested saving routes or tracks. 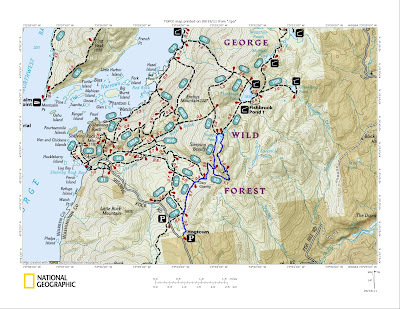 I'd like to determine hike distances, total elevation gain/lost etc. and then exporting routes into Google Earth or a topo map or terrain map, perhaps even tying images into the routes. I have not had any luck connecting this unit to the computer to download or upload routes. I must confess that I haven't yet done much research to figure out why this is not working. I've also just purchased Backcountry Navigator Pro (an Android App) for my Verizon DroidX. I just tried it out yesterday and am somewhat impressed by what I found. I was able to create a trip file and save track files within the trip file. 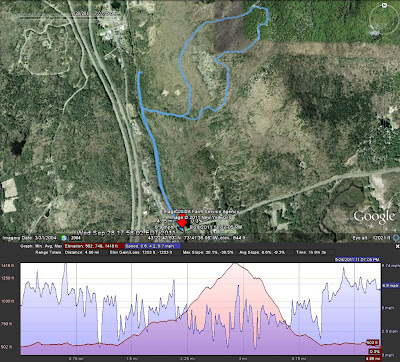 I was also able to export a .gpx file that I could pull into Google Earth. There are some pretty good statistics available for display including: distance traveled, elev. gain/lost, max/min elevs., +/- slopes, time, max/min/avg. speed. Elevation and speed information are also available in graph form. Considering this app costs only $9.95, I think it is a great bargain! The GPS screen view on my droid is much better than on my Garmin (much larger and brighter), however battery life is short when using this app on my droid. I suspect I'd only get 3-4 hours use before my battery died. 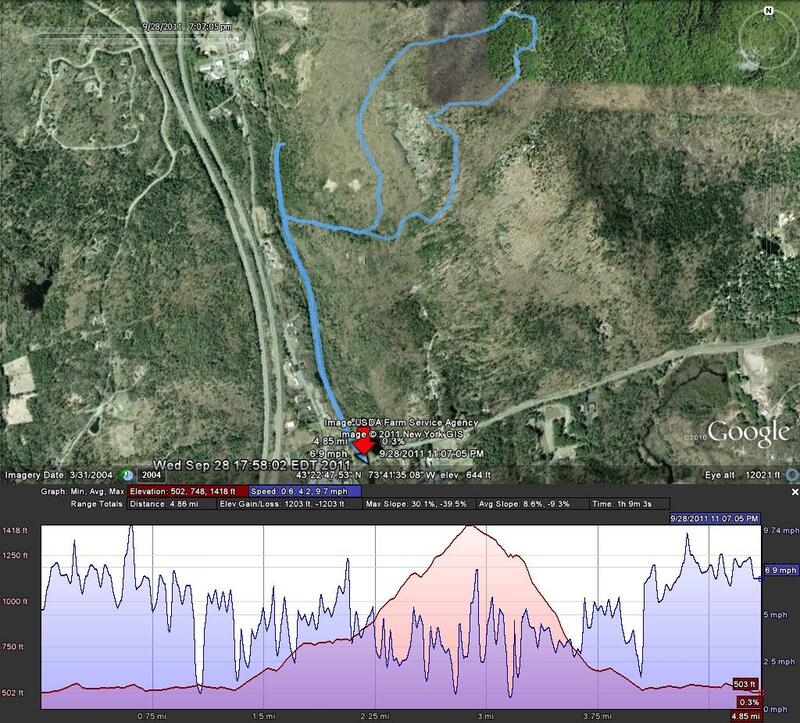 I used the Backcountry Navigator Pro app last night on a one hour trail run. As you can see in the image below (click to enlarge), I was able to get some nice results. Any tips that you have, or success stories that you are willing to share would be greatly appreciated! I'll share mine once I have some more knowledge here... Thx! The days are getting shorter now, and it's getting harder to squeeze in an outdoor activity on a week night before it gets dark. 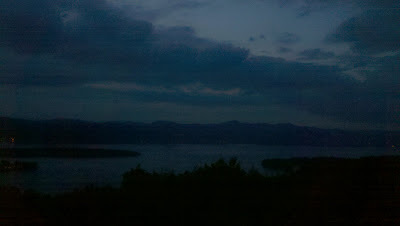 On Monday night, I was in Fort Ann, NY at my trailhead at 6 PM. This trail was the Pilot Knob Preserve, owned and maintained by the Lake George Land Conservancy (LGLC). In case you haven't heard of the LGLC, they own a number of magnificent properties in the Lake George area. 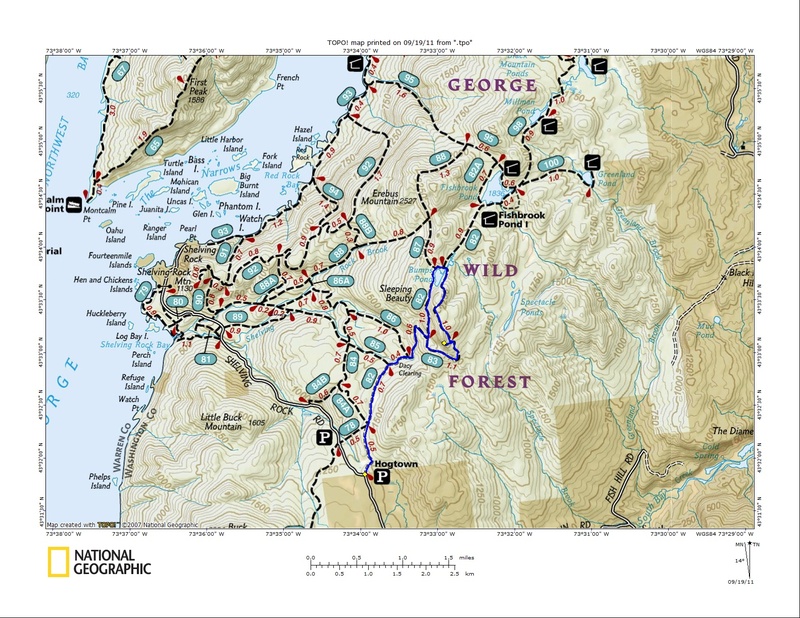 Be sure to visit their website for full trail descriptions and maps. There were two cars in the parking lot when I arrived. It was somewhat overcast, so I knew there wasn't going to be a nice sunset, but sometimes the cloud formations are just as interesting to watch at dusk. I had grabbed my gear from the house for a short trail run. This included a small rear pack with water, a granola bar, my GPS, a headlamp, extra batteries and my car keys. The Pilot Knob trails feature a gazebo on a high grassy plateau overlooking Lake George and a cascading waterfall further back in the woods. The official name of the preserve is the Lynn LaMontagne Schumann Preserve at Pilot Knob and it contains 223 acres. The blue trail starts at the trailhead at an approximate elevation of 370'. The trail rises fairly steeply on a somewhat rocky trail for just over a half mile to a clearing and gazebo at about 1000 feet. 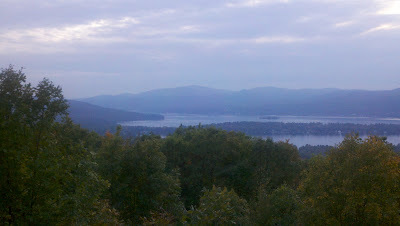 From here, there is an outstanding view westward and south and north from Lake George village past Bolton Landing and up through the Tongue Mountain range. Assembly Point, Cleverdale and Long Island are clearly visible below. This would be a great short climb to see a fantastic sunset on the right night. 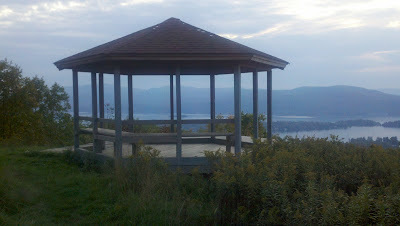 The gazebo has a built-in sitting bench and a "deck" extending from it. A nice spot for a picnic as well. 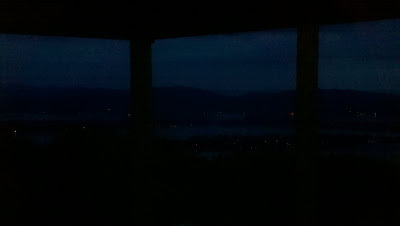 On this night, I began my trail run shortly after 6 PM and was at the gazebo by about 6:20. I stopped for a view minutes to look at the view and then continued on the blue trail another mile and a half to the waterfall. At this point, it was starting to get a little dark. 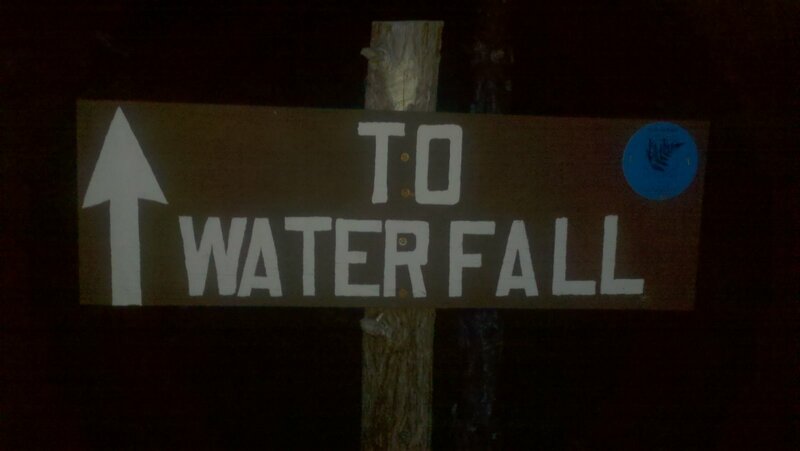 The trail loops around the top of the falls. I almost ran into a porcupine who had crossed my path and was beginning to climb a tree. I continued around the loop and returned to the gazebo around 7 PM. 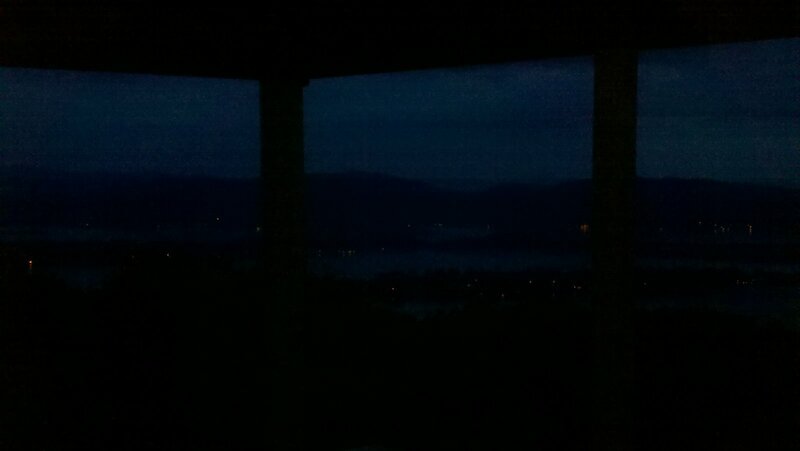 The sun had set and I could now see all the lights below. This was just as pretty as the view earlier. 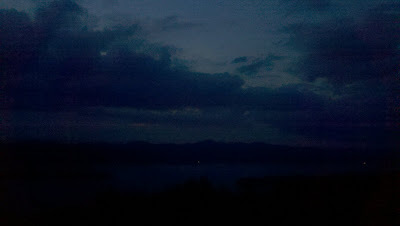 I switched on my headlamp and finished my run to the base, arriving about 7:15. 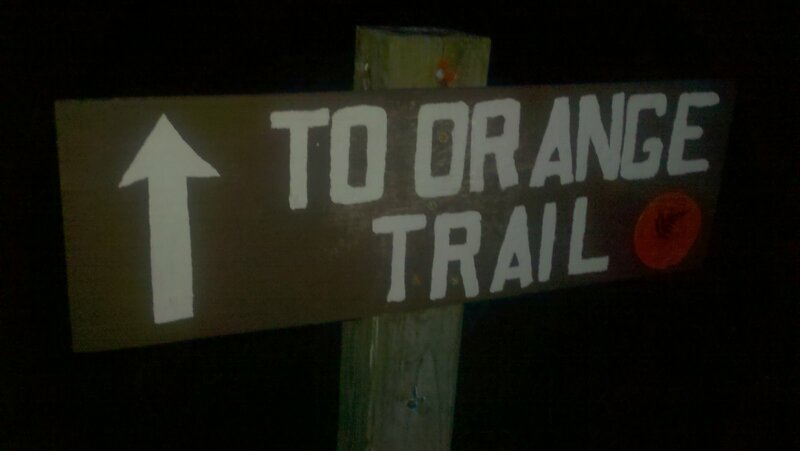 From the gazebo, there is also an orange trail that follows the remains of a former driveway back to to the trailhead. I did not take that on this night. Keep this preserve in mind when you've got a couple hours for a picnic, or you want to get a nice view for relatively modest effort. You won't be disappointed! 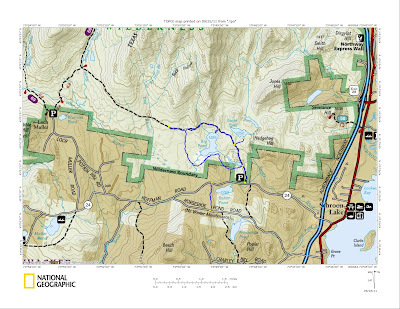 The Hoffman Notch Wilderness Area in the Adirondack Park lies in the east central portion of the park in Schroon Lake, North Hudson and Minerva and encompasses 38,500 acres. There are relatively few trails. 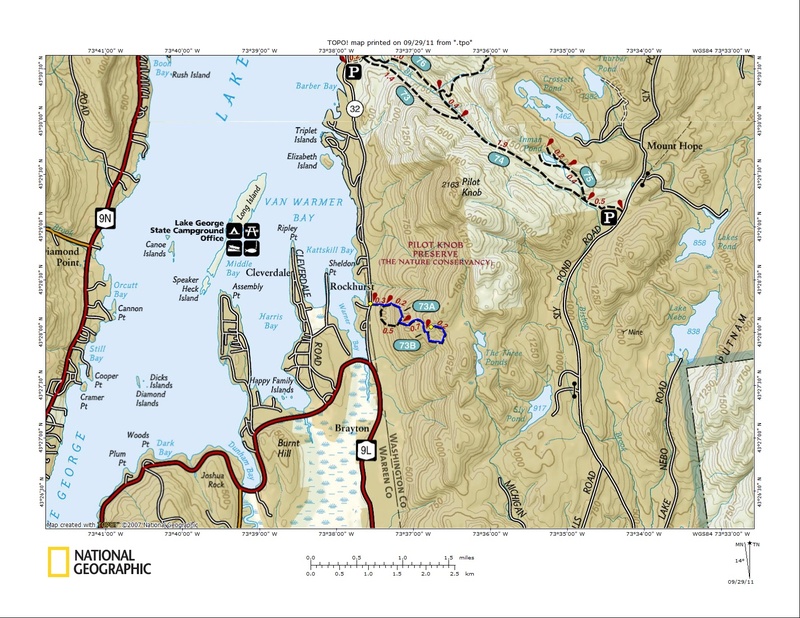 There is a trail that runs north-south from the Blue Ridge Road in North Hudson, to Loch Muller in Schroon Lake. 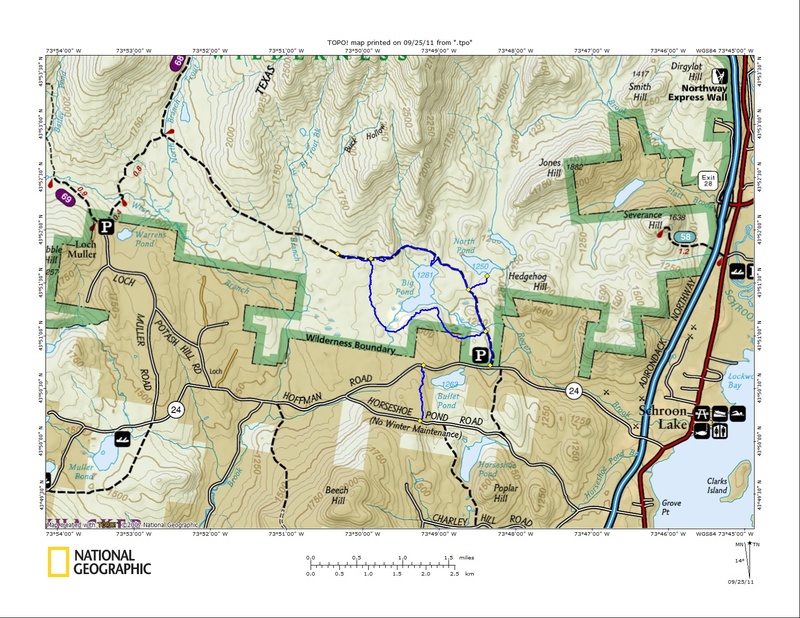 There is also a trail that starts on Hoffman Road in the Town of Schroon Lake and runs north past Big Pond then turns west and continues on to Loch Muller. My plan was to hike the latter starting on Hoffman Road and going past Big Pond to Loch Muller and then return. The Parking lot is not marked on Hoffman Road. If you head west on Hoffman Road (CR24) from Route 9 in the Town of Schroon Lake, you go almost 3 miles and just past a blue and white mobile home on the right, there is a pulloff with parking for about 5 cars. You walk in on the trail a couple hundred yards and you come to the trail register kiosk. I started about 8:45 in the morning. After about a half mile, you cross a substantial bridge at a drainage area that has a beaver dam just above the bridge. After another quarter mile, I came to a herd path on the right with faint orange blazes. I followed that about 5 minutes to the west shore of North Pond. A nice row boat was on the shore at that location and I went for a paddle around the lake. This was the rowboat I used for my morning paddle. It's great to paddle around a wilderness lake with not another person in sight. The pond is in a wilderness area, so there is no development anywhere. I did not see another person all day on this hike. What are these 2 newts doing under the mushroom? After a nice paddle I continued on to the north shore of Big Pond where there is a nice unofficial campsite. 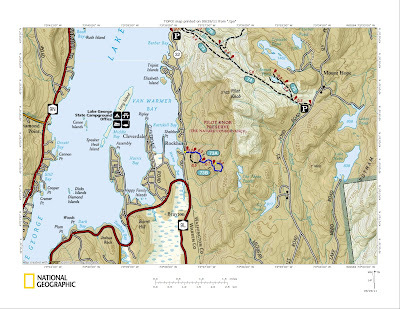 Hoffman Notch Wilderness Area does not yet have designated camping areas, although a Draft Unit Management Plan is in the works which will change this. Rowboat on the south shore of Big Pond. I did not paddle here. From the north shore of Big Pond, I continued west towards Loch Muller. Up to this point, the NYS Dept. of Environmental Conservation had done a great job of clearing the blowdown created by Hurricane Irene. About a quarter mile west of Big Pond, I came the endpoint of where the rangers had been able to clear in their day of trail work. I decided to continue on, but the blowdown was so extensive it was exhausting to continue, so I turned around. I was amazed by how many trees were down. I retraced my steps a short ways and then turned right (south) to follow another herd path with faint orange blaze to go around the east side of Big Pond and complete the Big Pond loop. I had followed this loop before in the winter time. Shortly after I began heading south I lost my Nalgene water bottle. It had fallen out of the side pouch of my pack. I had additional water, so it wasn't a problem. As I approached the southern end of Big Pond and began to swing east, the trail was submerged under about a foot of water from all of the rain we have had in the last month. 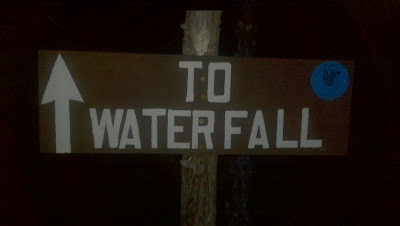 I was unable to skirt around the water, so I just followed a southern compass reading to return to Hoffman Road. For me, fall and winter are the best times to be hiking. Our first cool weather of fall came this past week and it was great. I woke up on Sunday, and it was in the low 40's. Leesa and I got up and out to do a half day hike before going to the "Jazz on the Lake" Jazz Festival in Lake George in the late afternoon. Sleeping Beauty Mountain was our target for this hike. 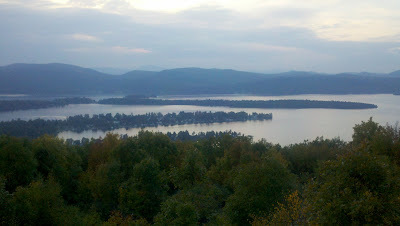 The mountain is located on the east side of Lake George, north of Buck Mountain and south of Black Mountain. We parked at the Hogtown Parking Lot in Fort Ann. Sometimes you can drive 1.8 miles further on a gravel road to Dacy Clearing, but the gate was closed on this day. Our total hike distance for the day ended up being 7.8 miles. We hiked up to the Sleeping Beauty viewpoint, which is not quite the summit, then continued north to Bumps Pond where we looped around the pond and came back. Note: As we approached the viewpoint, we saw a sign that said "Summit .1 miles" with an arrow that pointed the direction of the viewpoint. That is not the true summit. The true summit is further north, and you have to bushwhack a short ways off the trail to reach it. It is in the trees. 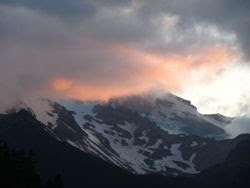 From the Sleeping Beauty lookout, you have an unobstructed view to the East, South and West. 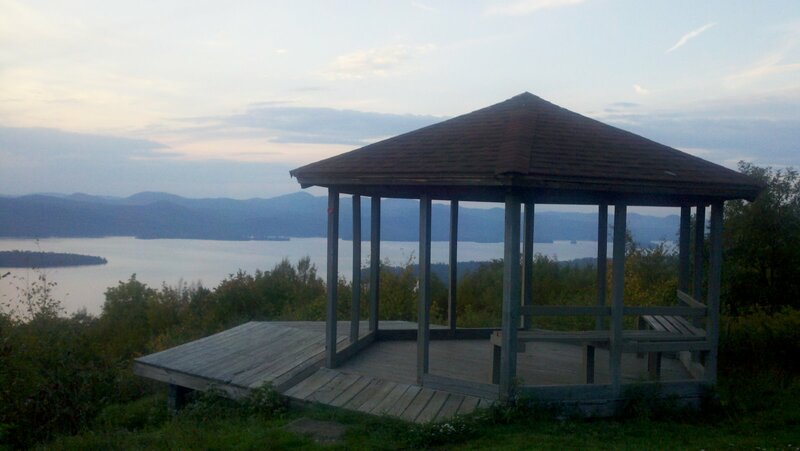 It is a fantastic spot, perhaps better than any other location on the east side of Lake George. The combination of the views, the grasses and the rock terrain is unbeatable. When we reached the summit we were the only ones there! We got to sit and eat our lunch and look around before anyone else showed up. There is plenty of room on the summit and lots of nooks and crannies for people to enjoy the summit in privacy, but it is still nice to have an entire summit to yourself. i want to camp right here. It is the perfect spot. After spending about an hour at the exploring, we continued northward passing over the actual summit, then we descended to Bumps Pond. We went counterclockwise around the pond and followed the loop back to the trail split .6 miles above Dacy Clearing. Several people rode bicycles to Dacy Clearing and then began their hike. That effort saved them 3.6 miles of walking in and out on the gravel road. The old gravel road is pretty, but it adds some time on to your hike if you are on foot. 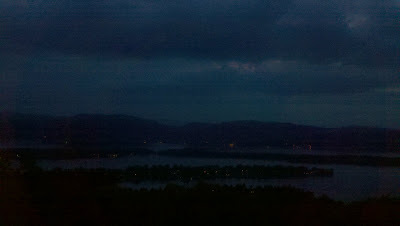 Sleeping Beauty Mountain is certainly one of my favorite peaks in the Lake George region. I'll have to return to camp near the lookout.